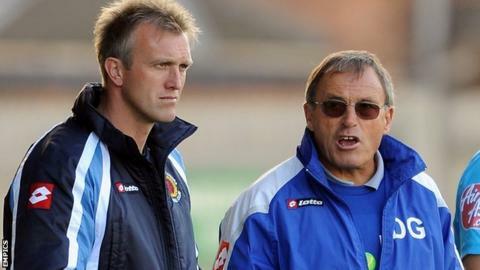 There have been three attempts to replace the irreplaceable and fill the shoes of Crewe Alexandra legend Dario Gradi at Gresty Road. The first two, Steve Holland and Gudjon Thordarson, failed. So what was it about Steve Davis that made Gradi think he was doing the right thing when he phoned chairman John Bowler one Sunday morning back in November to tell him that was planning to step down for the third time? Holland has gone on to enjoy success higher up, having been a key part of Chelsea's amazing night in Munich last weekend. 1 June 1983 - Replaces Peter Morris as manager. 1997 - Gradi opens Crewe Alexandra's academy. 22 September 2003 - Gradi undergoes heart surgery, leaving number two Neil Baker in charge, but the Alex pick up just one point in their month without him. 1 July 2007 - Steps down as manager to concentrate on Crewe's academy, handing over reins to Steve Holland. 18 Nov 2008 - Becomes caretaker manager following Holland's resignation. 29 Dec 2008 - Gudjon Thordarson takes over as manager. 17 June 2009 - Thordarson brings in Steve Davis as his number two. 2 Oct 2009 - Thordarson sacked. Gradi returns as manager. 8 Oct 2009 - Gradi brings back Neil Baker to coaching staff. 13 Nov 2011 - Gradi resigns. Steve Davis takes over as manager. Appoints Neil Baker as assistant manager. And Thordarson did at least leave one lasting legacy, having been the man who brought Davis to the club in June 2009. But whatever it was that both men saw in their number two, this time it has proved third time lucky for the Alex. "Steve had worked with me," Gradi told BBC Radio Stoke. "I thought he would work along the same lines. "It wasn't a question of deserting a sinking ship. I just wasn't enjoying it. It was one of those rare times when the job actually felt like work. "I was still working at the academy, but every single minute of every day was taken up with the actual football. More and more, the manager's job was taking over my life." As it was, Davis's introduction proved the catalyst for Crewe. They were 18th in League Two - just one place and two points above ultimately-relegated Hereford - when Gradi quit. But the Alex have lost just four league games since - and go to Wembley for Sunday's League Two play-off final against Cheltenham Town on the back of an 18-match unbeaten run. And Gradi pinpoints the use of his old number two Neil Baker as Davis's father figure as a key element in their success. "The masterstroke was bringing back Neil Baker," said Gradi. "It's what I'd have hoped for, but not necessarily expected. I thought Steve might want to bring in a long-term friend. But they have made a terrific partnership. "Together they've freshened things up and managed to get the club going forward again." After restoring hope to Gresty Road, now comes the hard part for Davis - fulfilling so many expectations. Gradi led the Alex to their only previous play-off success when Shaun Smith's first-half goal helped his team of promising youngsters beat Brentford to reach Division One in 1997. And he is confident that Crewe's new generation can be Wembley winners too. "It's a horrible place to go to and lose," said Gradi. "But Steve knows that and he's prepared for that. "It might be a day out for the fans but it's not for the players. And it won't be a day out for the fans if we lose, because they won't enjoy it anywhere near as much. "It's a place to go and win but they'll have that mentality, the boys." And especially for Gradi, the club's mentor now for almost 30 years, and the man who started 12 of Sunday's predicted 16-man squad on their way in the game, winning would mean more than anyone. "I always say I've never worked in my life," he said. "It's fun. It's a pleasure. "The satisfaction I get is the difference I've made with my own contribution to people's lives. "Not just the kids, but the likes of Geoff Thomas and Luke Varney, who came a bit later. "They've had a life they perhaps would not have had if we had not got a club like Crewe Alexandra here. "If an Arab billionaire came in now and said 'Come on Dario, here's the money, take Crewe into the Championship', I don't think I'd be the man for the job. "Roberto Mancini wouldn't want to put all his kids in the team. He's better coaching higher quality players. "But I wouldn't get the same satisfaction that I get from coaching the kids. "I don't think you can beat the pleasure you get from working with kids and helping to define their lives." Interview by BBC Radio Stoke's Graham McGarry.